UNUSUAL DESIGN. A modern railway station at Versailles. The station is served by both steam and electric trains, and is on the system of the French State Railways. There are four double platforms each 1,312 ft in length. THE primary function of any railway is admittedly to transport both passengers and goods in the minimum of time and with the maximum of safety. In modern conditions considerations of comfort also weigh heavily with the travelling public. In addition to comfort, we have the aesthetic aspect of railway work. The days of hideous stations, ugly administrative buildings, and signal cabins or bridges that spoil the landscape are rapidly passing. Modern development enlists the services of the trained architect for planning railway buildings - from the smallest signal cabin to the stately and beautiful stations to be found all over the world to-day. Architecture has inevitably undergone many changes during the last century - conforming to public needs, popular taste, and the opportunities presented by improved methods of construction. Its application to railway work has also changed with the times; the old Victorian buildings offer a striking contrast to the imposing structures, in steel and concrete, of the post-war period. The evolution of the modern railway station provides many outstanding instances of the architect's services to the engineer. Primarily a station was regarded as a starting-point or stopping-place for trains. 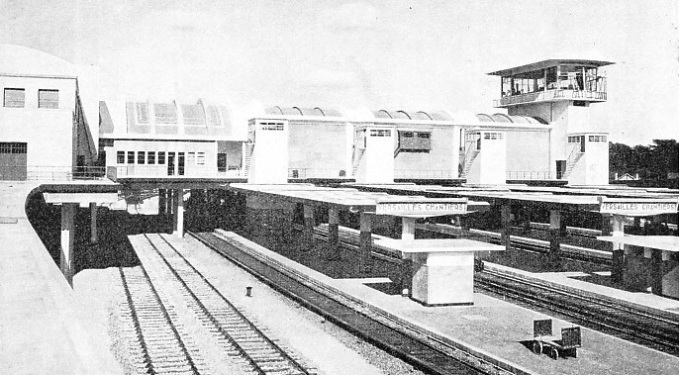 The first obvious provision was one or more platforms to facilitate the entering and leaving of trains. Barriers to exclude the non-travelling public, ticket-offices - bearing little resemblance to the old coach booking-offices - and waiting-rooms followed in due course, together with roofs to cover at least part of the platforms. Large numbers of stations, particularly in country districts, were built of wood, gradually giving place to brick buildings as additions followed increasing traffic. Most of the important terminal stations, even in the early days of railways, were generally built with lofty arched roofs. Apart from the convenience in construction, this type of roof permitted the escape of smoke from the locomotives standing at the platforms. A natural development of the main terminus was the inclusion of the company’s administration offices in the station buildings. The use of the single-span arched roof for station work has been a feature of railway architecture for many years. Examples of such roofs are to be found at St. Pancras, Cannon Street and other London stations. Frequently the roof is divided into three arches, as at King’s Cross Station, London, and in recent times at Milan, one of the most remarkable stations in the world. In former days a station roof would serve a double purpose - to protect the premises from the weather and also to collect water for use in the locomotives. An interesting example of this practice was the old station at Selby, Yorkshire, built in 1835. This station cost £10,300 to build, and is still in existence, although now used exclusively for goods traffic. In its original form the station comprised a series of sheds over the lines with offices and warehouses adjoining. The trussed timber roofs of the sheds were in three parts, supported on hollow cast-iron columns. It was through these columns that the rain-water for the locomotives drained into underground tanks. Selby Station, together with the Leeds terminus of the old Leeds and Selby Railway, had no platforms or waiting-rooms, and each station served for both goods and passenger traffic. A difficulty experienced by the builders of early railway stations was the necessity for increasing the accommodation at frequent intervals The original Paddington terminus of the GWR was opened in 1838, but by 1845 several additions and alterations had been made. A particularly interesting feature of the first Paddington Station was the building of Bishop’s Road bridge immediately behind the station. This bridge formed the station front, and its arches were used as waiting-rooms, booking-hall, and offices. Other arches served as entrances and exits for carriage roads. The goods depot at Paddington lay on the opposite side of Bishop’s Road bridge to the original passenger station, which was in use for some twelve years. In 1850, however, traffic had grown to such an extent that plans were put in hand by Brunel, the Great Western engineer, for Paddington Station as it exists to-day. The main portion of the station was finished in 1854, and the total cost of the work was £650,000. The station interior was 700 ft long with a width of 238 ft, divided by two rows of columns into three spans of 68, 102 and 68 ft. At two points the main building was crossed by 50 ft transepts, accommodating large traversing frames for moving locomotives or rolling-stock from one track to another. The supporting columns were bolted down to large masses of concrete and the roof was carried by wrought iron arched ribs, covered partly with corrugated iron, and partly with glass. The station of 1854 was in use without extension for more than fifty years. Brunel was assisted in the ornamental details of the work by the nineteenth-century architect, Sir Matthew Digby Wyatt. A feature of the station decoration was the iron scroll work at the western end, which was not removed until the early part of 1935. At the eastern end was built the Great Western Hotel. Under the hotel are entrances to the London Underground Railways. The design of railway stations has led to the adoption of an infinite variety of types, depending on local circumstances and requirements. Considerations of space have led to some rather unusual arrangements in railway-station planning. At Sydenham Station on the Southern Railway suburban line the down platform does not face the up platform, which is built farther south, on the opposite side of an over-bridge carrying a roadway The south end of the down platform is not connected with the north end of the up platform except by the road bridge. The station has been built in this curious shape because of the lack of building land opposite either platform. The situation of a station is generally governed by the proximity of a town or village to the line, and the site chosen is naturally as close as possible to a main road. Where a road crosses the railway, a very popular position for the main station buildings is on the road bridge, with long ramps leading down to the platforms below. The design of any station depends mainly on the requirements of its position and the convenience of the buildings both for the use of the railway staff and of the travelling public. The design of the large stations, particularly where the frontage of the street is occupied by a large railway hotel, has usually followed the architectural tendency of the period. The Georgian and Victorian styles of building are exemplified in the older railway stations and hotels of Great Britain, but new construction has shown a decided tendency to strike a modern note. 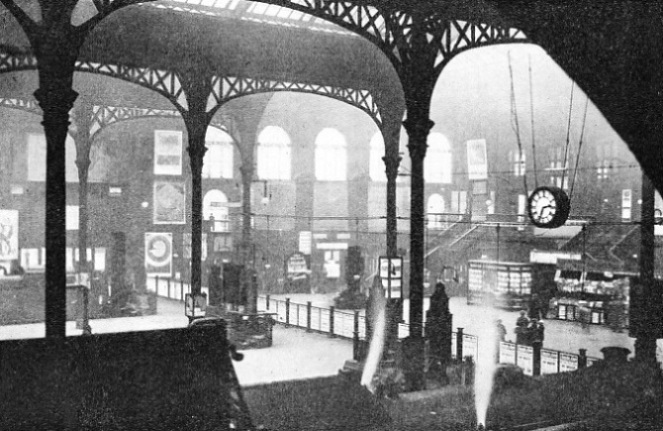 Many notable examples of modern architecture are exemplified in station buildings both in Britain and abroad. An example of recent construction in reinforced concrete is to be found on the Northern Railways of France at Lens. Interesting features of this station are its concrete clock tower and the twin pylons that carry the telegraph wires. The cross-ties of these pylons above and below the insulator bars produce an effect reminiscent of the bead-frames used by children in the earliest stages of their mathematical education. 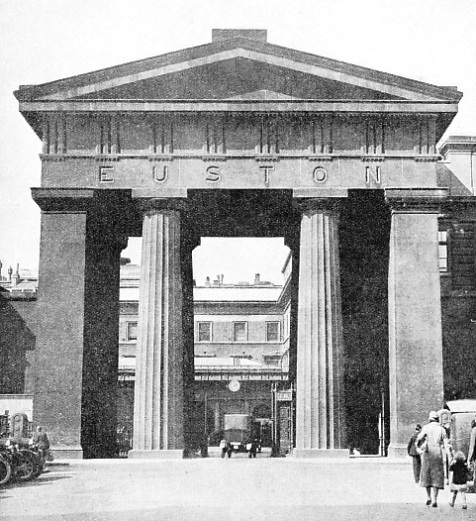 DORIC COLUMNS are embodied in this entrance to Euston Station, one of the LMS London termini, which is a fine example of neo-classic architecture. The arch was completed in 1839 at a cost of £35,000. The stone was brought from Bramley Fell quarries in Yorkshire. France also provides another fine example of modern architecture in the station at Versailles, the severity of the curved facade being relieved by the arched windows that incorporate double swing doors giving access to the spacious booking-hall. The single span arched roof is glazed in a lace pattern with square and circular panes of glass, giving a pleasing effect. One end wall, above the ticket office windows, displays a huge map of Western France. Facing the entrance doors is a fine clock, without numerals, flanked by rectangular indicators providing particulars of train departures and arrivals. The galleries leading from the booking-hall to the platforms are designed on the same generous lines with walls panelled for the display of artistic posters depicting places served by the station. Many remarkable stations have been built in recent years in the London district to serve the ever-lengthening tentacles of the Underground Railways. Some of these stations are in almost rural surroundings, and the architects have taken every advantage of an opportunity to combine the practical with the artistic in evolving their design. Some fine stations were built on the Southgate Extension of the London Underground Railways, each having similar points in style and decoration but differing widely in general design to suit local conditions. The construction of these stations was carried out in st eel and reinforced concrete, with walls of brick. All the concourses are lined with glazed tiles with variations of colour to give pleasant contrasts. A feature of these stations is the provision of a relief shaft, to mitigate the effect of the draught caused by trains entering or leaving the platforms. The station below ground is connected by a shaft to a louvered tower. As a train enters, the air blast is forced up the relief shaft instead of subjecting passengers on the platform to a miniature tornado. Similarly a train leaving the station draws air in through the tower to fill the partial vacuum created underground. An interesting problem arises in connexion with this “suction” effect in the wake of a fast train - nobody can have failed to notice the swirl of paper and dust caused by the flash of an express through a station. With great increases of speed it is probable that station roofs will have to be re-designed to obviate their being damaged by the force of these artificial cyclones. Southgate Station resembles other modern stations on the Piccadilly line, having wide entrances with direct communication between booking-hall and platforms, and well-arranged equipment. The main station building, however, is circular with a wide canopy, above which is a continuous, but smaller, ring of metal-framed clerestory windows. The canopy is lighted from below at night-time by a box-light carried round the building. The concrete roof is supported on small steel columns. A concrete encased steel column supports the centre of the roof, surmounting which is a lantern, topped by a spun copper ball. The lantern comprises a series of concrete rings with glazed bronze frames between them. Lamps behind these windows illuminate the station at night-time. In addition to this lantern, however, there are two illuminated concrete masts that rise from polygonal kiosks on either side of the station. Each mast carries the bull’s-eye emblem of the Underground Railways. BOUNDS GREEN STATION on the Piccadilly line. This station is on the extension from Finsbury Park to Arnos Grove which was opened in September 1932. A feature of this station in North London is a relief shaft to ease the effect of draughts caused by trains entering and leaving. ARNOS GROVE is another station of modern design on the Piccadilly line. 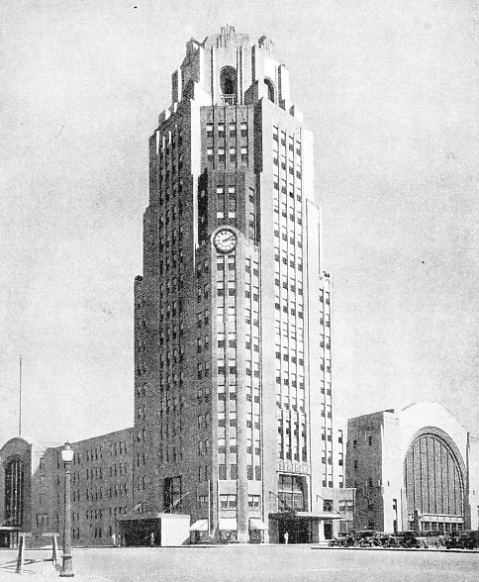 The construction of the station was carried out chiefly in steel and reinforced concrete. The floors are of concrete or rubber according to the position. 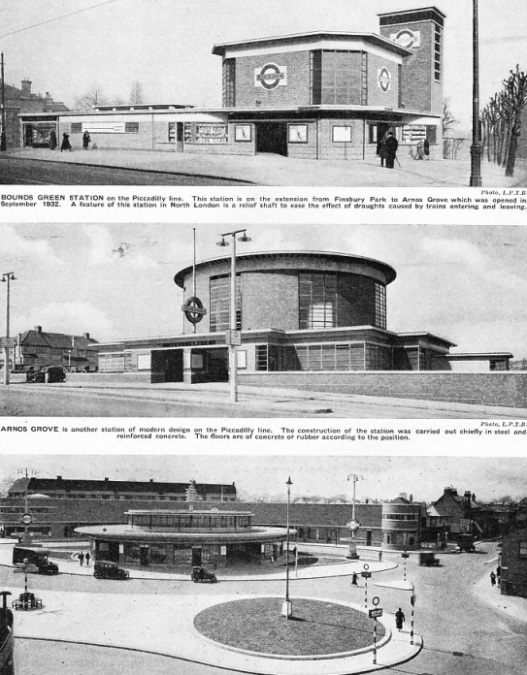 SOUTHGATE STATION on the Arnos Grove to Enfield section of the Piccadilly line was opened in March, 1933. In general planning it follows the design of the other modern stations on this tine. Escalators lead to sub-surface stations. Station architecture has in the past conformed as far as possible to the general style of the town that is served by the railway. This is particularly true of such countries as Belgium, where the railway station will often closely resemble the buildings surrounding it. Where a town has a medieval tradition the station buildings will, when possible, be built in the form of a castle, with battlemented walls, even the clock tower appearing as a loopholed turret. A station with a distinctly medieval aspect is that at Ghent St. Pierre on the Belgian State Railways, where the motor cars in the forecourt provide a striking contrast to the castle-like walls of the booking-hall and administration offices. One of the most notable examples of railway construction that conforms to local tradition is the LMS bridge over the river at Conway. The bridge is built in the same style as the adjacent Conway Castle, and thus harmonises with its surroundings. Battlemented walls and turrets are frequently employed by railway architects as decorative features of tunnel mouths, and many fine examples exist in the country districts of Britain. MODERN ARCHITECTURE is typified by this Great Western signal box at Cardiff West. Signals and points are power operated. The three-floored box has steel framework with red-brick filling. The ground floor contains the switchboard, transformers and rectifiers. The first floor has the relay racks and other equipment. The top floor is the operating room with an interlocking frame having 339 levers. Bridges, especially those built of iron or steel, have generally been regarded as being within the province of the engineer. Some bridges and viaducts do, though, represent the very best in the architecture of both the past and the present. The simplest brick or masonry bridge employs one of the earliest architectural devices - the arch. Naturally the number of arches was increased as requirements demanded, and in due course the size of the arches was augmented with improved methods of construction. The use of reinforced concrete has resulted in some single-arch bridges of remarkable beauty that do full justice to their surroundings, whether over deep ravine or mountain torrent. Long viaducts, too, have a charm of their own and generally display features of real architectural merit. Many of the finest bridges and viaducts in existence were built more than half a century before steel and concrete came into general use. The employment of reinforced concrete, however, does not imply that the bridge or building will present too severe an appearance in surroundings that call for artistic treatment Concrete structures are often faced with stone, coloured brickwork or even marble. A FRENCH SIGNAL CABIN of artistic design at St. Denis, four miles north of Paris, on the lines of the Northern Railways of France. It is not on stations and bridges alone, however, that the skill of the architect is expended. Many of the humbler, yet no less essential, railway structures are the subject of much thought and careful planning by the architect. Signal cabins, for example, have undergone revolutionary changes in recent years. Many fine types of signal box have been evolved in Britain and abroad. 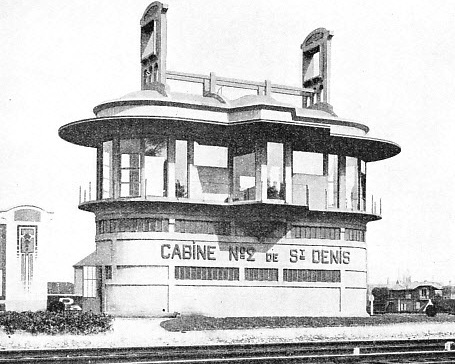 A striking example of the application of modern design to a signal cabin can be seen at St. Denis on the Northern Railway of France. This is a concrete structure with rounded ends, the whole of the upper story being of glass surmounted by an overhanging roof carrying framework for the reception of telegraph wires. An additional bay is built out from the side of the cabin nearer the track, affording an uninterrupted view of both up and down traffic. This bay, in common with the rest of the upper story, is provided with a railed balcony. With the use of concrete for constructional work, formerly done by the engineer, the architect has been called upon to design water-towers and other structures for the railways’ locomotive departments A well-designed water-tower in reinforced concrete is far in advance, architecturally, of the iron tank supported on girders or set in unrelieved brickwork. In all railway buildings the requirements of the engineer must be given very careful consideration. Particularly is this so in the design of such structures as engine “round-houses”. These buildings must be so arranged that the largest number, of locomotives can be accommodated in a given space A circular plan is often adopted with tracks radiating in a manner similar to the spokes of a wheel from a central turn-table. Thus, a main doorway is provided so that an incoming locomotive can be run on to the turntable, which is revolved until the engine is in a position to leave the table for its “stall”. A feature of round-house design is the provision of chimneys fitted with large “aprons” that take the smoke away from the locomotives through the roof. Signal-cabins, water-towers and engine-houses all provide excellent examples of architecture applied to the requirements of the engineer. Railway stations, however, are designed primarily to enable the largest numbers of passengers to enter or leave their trains in the shortest possible time. The fact that modern stations are pleasing to the eye is incidental to their usefulness in coping with large crowds. THE INTERIOR OF LIVERPOOL STREET STATION with its iron columns and girder work is typical of many London termini. The station was formerly the terminus of the Great Eastern, and was opened in February, 1874. The terminus occupies an area of sixteen acres. You can read more on “Milan Central Station”, “The Romance of a Station” and “Stations and Their Story” on this website.